I think the perfect addition to your fall wardrobe is a great pencil skirt. I found this faux leather version at an adorable boutique (Style Society). The pencil skirt is such an essential fall staple. 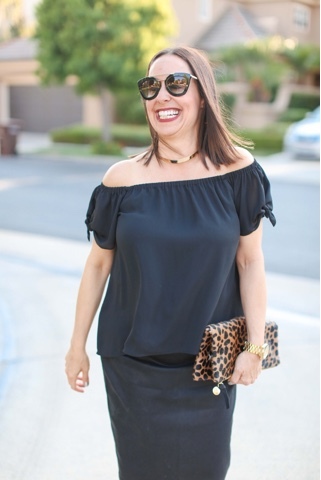 I paired it here with a fun off the shoulder top, some great heels and my new favorite leopard clutch (p.s. 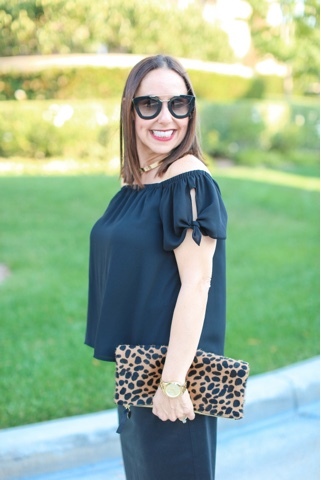 adding leopard to all black is such a fun chic look). I also added the adorable gold choker and some great sunnies!!! This is a dressier look, but you can also style a pencil skirt causally with a fun shirt and denim jacket. It is such a versatile piece. What do you think of this look? I would love to hear some ways you style your favorite pencil skirt. You can shop my look by clicking on the links above. Thanks to Taylor Cole for photos and Happy Reading !!!!! !